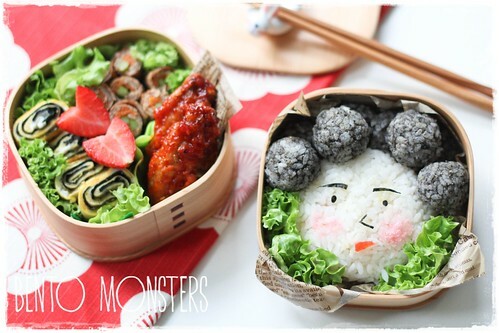 If you are not a fan of Korean drama, you will probably have no idea about the bento I'm sharing today. The drama that inspired today's bento is the korean adaptation of the smashing hit "Boys Over Flowers". It's not a recent drama and not one I would recommend as must-watch even though it was very popular. If you have watched the drama before, you might recall that Geum Jan-di (Ku Hye-sun) made two bento for Gu Jun-pyo ( Lee Min-ho). I chose to remake the second bento, the one they brought for their picnic. I did not copy the contents of the original version entirely. I made seaweed tamago and veggie meat rolls which were also present in the original bento. I added on spicy korean chicken in the bento, made this for my boys' dinner but this is a bento I don't mind having, contains all my favourite food. 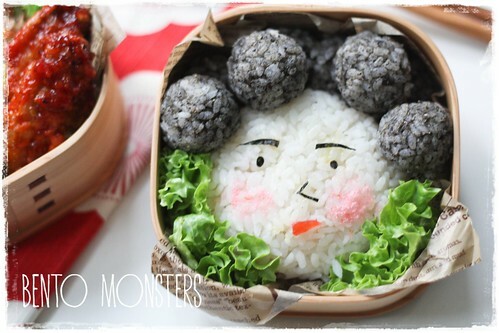 The hair was made using rice mixed with grinded black sesame. I used nori, sakura denbu and tomato for the facial details. 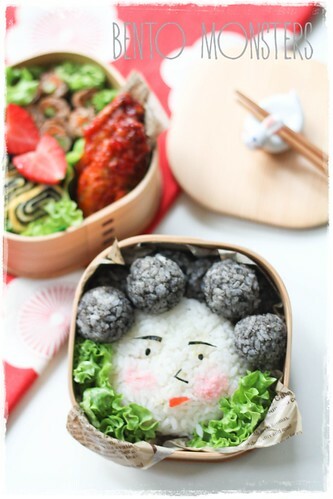 I didn't watch this drama, but your bento looks great as always! I have no idea but interesting character nonetheless! Hahahahahah this is tooooo cute!!! I have to say I can't believe I liked that drama once upon a time, and that bento episode was just too adorable. Great job with this!